Please make sure you have BuddyPress installed and activated before creating the registration and activation pages. If you haven’t already done so, you still can install this plugin before proceeding to the following steps. 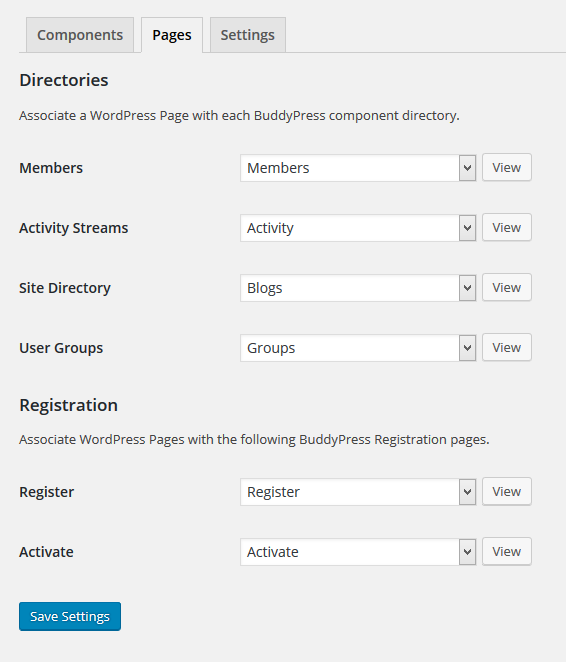 BuddyPress auto generates the component pages for you. However, if you have open registration off in the WordPress general settings these pages may not get auto created. For users to sign up to your new BuddyPress powered site you will need to enable registration. Visit Settings > General in the WordPress admin and make sure you have “anyone can register” checked. Both sites and user accounts may be registered. After you have enabled registration, you can create the required pages and assign them to the register and activation components. Visit Settings > BuddyPress and then click the Pages tab. Assign each page to the right feature and click Save Settings.